On November 22,1963, three shots rang out in Dallas, President Kennedy died, and the worldchanged forever. If you had the chance to change the course ofhistory, would you? Jake Epping is a thirty-five-year-old highschool English teacher in Lisbon Falls, Maine, who makes extra money teachingadults in the GED program. He receives an essay from one of the students—agruesome, harrowing first person story about the night 50 years ago when HarryDunning’s father came home and killed his mother, his sister, and his brotherwith a hammer. Harry escaped with a smashed leg, as evidenced by his crookedwalk. Not much later, Jake’s friend Al, who runs thelocal diner, divulges a secret: his storeroom is a portal to 1958. He enlistsJake on an insane—and insanely possible—mission to try to prevent the Kennedyassassination. So begins Jake’s new life as George Amberson and his new worldof Elvis and JFK, of big American cars and sock hops, of a troubled loner namedLee Harvey Oswald and a beautiful high school librarian named Sadie Dunhill,who becomes the love of Jake’s life—a life that transgresses all the normalrules of time. StephenKing and I have an odd working relationship. I just recently read my first Kingbook and decided I loved his writing style so I ventured into his other books.While I absolutely love his Dark Tower(I’m on book three) books, I have a hard time getting through pretty muchanything else written by him. I don’t really know why, either. I usually lovelong books. I love detailed, lyrical prose. I love unique, mind-bendingstories, and he is a master of all of that. I just can’t seem to make myinterest level last past the halfway point. Ihad high hopes for 11/22/63. Thesubject was well known which meant that King had to do good research to make itbelievable (which he did). It was also one of his less mind-bendy novels, so itseemed to be the right sort of fodder for what I needed when I read it. So far,11/22/63 has been getting wonderfulreviews. This seems to reinforce the fact that I have no clue what it is aboutKing’s writing that causes me to struggle, but there’s something there. 11/22/63 is a time travel novel. WhileI’m usually not big on time travel, King does it with style. The protagonist,Jake Epping, finds a time portal of sorts in the back of his friend’s hamburgerjoint. Then, he starts to wonder what would happen if he traveled back in timeand stopped JFK’s assassination. That is the main premise of the book. Intypical King fashion, the writing is superb, the story is tightly woven with noreal plot holes and his historical detail and research is superb. I learned asmore than I should have from a book that was this enjoyable. Thoughthis book does focus mostly on history, and King paints a wonderful, apple-pieversion of 1950’s America, there is also a love story involved. While thistakes the back seat to other plot events, the book left me wondering if 11/22/63 was mostly a love story wrappedin an interesting JFK novel. Ireally enjoyed 11/22/63, but therewere a few issues for me, which probably helped me hit my “seriously, how muchlonger does this book REALLY NEED to be?” point. For example, the only realreason Jake Epping (who is a rather boring individual and is saved by the graceof an interesting plot), decides to save JFK is because an acquaintance whoserves him burgers at a local dive restaurant basically told him to, so hedropped everything and said, “okay.” I don’t buy into that. I can’t honestlybelieve that any sane, logical person would jump through a rabbit hole becausesome guy painted them an interesting, “what if” picture. Because that’s theplot point that the whole book hangs on, my ability to believe in the plot wasstretched rather thin during most of the book. Secondly,I did hit that halfway point where I wonder how long King really needs to makea book to tell a story. I got exhausted, and maybe that’s my problem with mostStephen King books. While he’s an excellent storyteller, and some of hisdescriptions border on genius, his books are just too long for the stories theycontain and the characters, like Jake Epping, is too boring to fill a book thatlong. 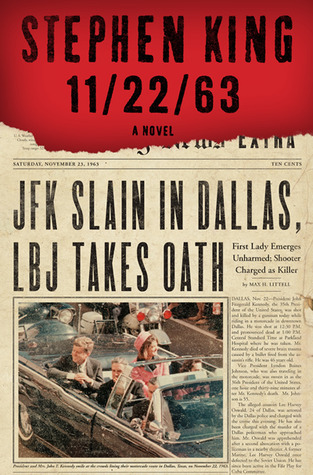 11/22/63 would have been awonderful book if it had been shorter. 11/22/63 wasn’t the book for me, but itseems to be a real hit with most people. King is a wordsmith, and his prose areeasily what gets him to be a top selling author with each book he releases. Hisworld comes alive with his unique and powerful descriptions. He did plenty ofresearch when writing this book, and it shows. This book could have worked ifit was shorter, and Jake Epping was a bit more interesting. Perhaps I’m a badperson to review a King book, as most of them just don’t hit the right spot forone reason or another, but despite my qualms, 11/22/63 is a strong book thatwill appeal to both fantasy and fiction fans alike. Good review! I used to love SK, and still do love many of his older works. But I haven't enjoyed his more recent offerings (mainly books written after his accident), which somehow don't have the same intensity. Have you tried any of his short story collections? No! I didn't know he had any. I will look them up and see if any are at the library. Thanks for the tip!